Let's Build a Guitar! #3: It's been awhile, time to start again. Well, it’s been over a year since I started this blog. A lot has happened and a lot of things have changed. The female half of our owner couple at the park passed away, I have been in the hospital and told I have some severe heart problems, then, we found out the male owner detested us and did everything in his power to get rid of us, short of firing us. Then, thankfully, the park sold to a new owner and I was informed I could put my shop back together after the old boss told me the electric bill was too much. (That took me several months). A few days ago I was put on a high dose of Nitro because some of the problems had gotten much worse, (I can’t work more than 5-6 minutes without 10 minutes resting time). I also had to back out of a promise to a friend I care about a lot to design and build a band saw mill that would be accessible for him. I just don’t have the strength or stamina to do stuff like that anymore. Anyway, thanks for reading all that boring stuff before you got to this point. I have decided I have 4 or 5 projects I simply must get done before I can no longer do this anymore. One is to finish this guitar and give it to my son who has become 50 times the guitar player I ever was. I will use the original basswood body but I have replaced a lot of stuff with custom parts. I found a set of classic humbucking Gibson pickups vintage around 1960, not PAF humbuckers, but pretty good. Grover 18:1 tuners, NOS, chrome. I also found a Bigsby trapeze tailpiece and bridge from a 1964 Gibson Les Paul. I am now looking for a neck for this “Frankenguitar” because as much as I enjoy the look of the original and I’m not able to make one myself, especially with the profile he uses is out of the question. Anyway, I have been looking around for a veneer to put on this guitar, front, sides, and headstock and back. (I won’t say why I need a new veneer, but it didn’t come from over sanding or bad dying). 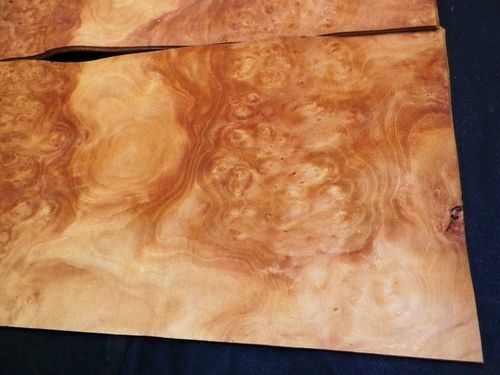 Well, today I was poking around on eBay and I happened to find some veneer I REALLY like! This is gorgeous stuff. 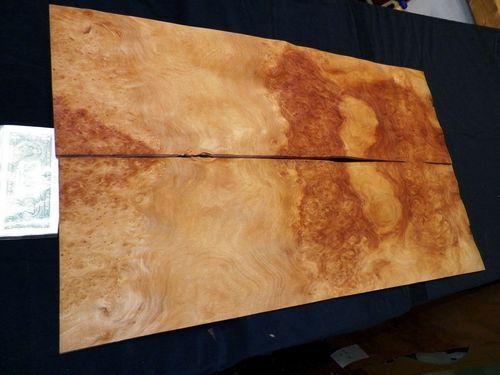 It is called London Plane tree burl, and I bought 4 sheets, 10 1/2” x 35” for $34.00, shipping included. It is raw and can be bookmatched, and if I make a mistake I will have enough to redo it. This is going to be a slow learning and building process for me so please bear with me, it might take more time. No promises. These are pictures of the veneer. I hope you enjoy them. You’ve sellected great looking material I know this blog is going to be cool and your finished guitar will be a knock out. Getting old certainly takes a lot more nerve than living fast, loving hard and dying young! Sounds like you’re going for it. looking forward to the project! Sorry to hear of your health issues. Hope you will pull through it all ok. One step at a time. Wish you well. Look forward to the projects upcoming. Thanks all! I’ll try to answer in the order they were posted. Jim, I really really like that veneer also. I almost hate to use it for that purpose, but then again I can see that there could be a number of ways to lay this out and the guitar would be one of a kind, especially with four matching sheets. TopamaxSurvivor, I figure the person that has had the most birthdays wins! I pity those that were born on February 29th. Thomas, I don’t know how long it will take since I can’t work very long at any one time, but I am determined to finish this and the other projects I have promised someone else or myself I would make out of love or respect. I would still try to build the band saw mill I promised my friend, but I cannot even stay on task long enough to do much design. Roger, Thanks, I will still be posting here off and on and especially giving my curmudgeonly advice on how to do something. Never fear, I never let being wrong slow me down! Things I’m trying to figure out on this: Since this is a contoured top guitar, using clamps and cauls to glue and press the veneer down would be a pain, especially having to carve out cauls to match the contours of the top and bottom. The best Idea I can come up with is to use one of those vacuum suction bags, hook my antique Craftsman shopvac to it until it’s collapsed, seal it and put it in another vacuum bag and pull a vacuum on that. I’m not sure how that will work, but with the way my mind is working, it’s about all I can come up with. Besides, I sold my big vacuum press to pay some bills. Next, I have a bag of new, hot hide 192 glue. I think that will provide a better joint than the TB or Gorilla Wood Glue. Historically, Hide glue and fish glue have been used but I’ve never tried fish glue and am not sure how to use it. Then there is dyeing. 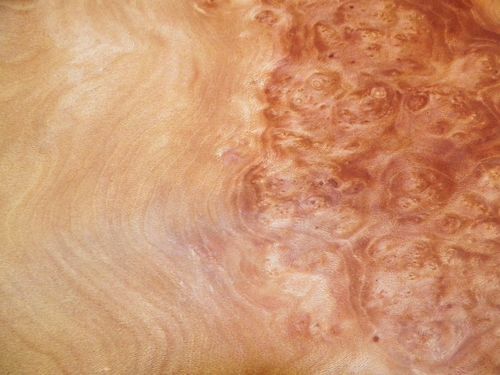 I am not sure I even want to dye it, it might be good the way it is, although from those pictures, I think the light wood good use a more golden hue to bring out the depth of the burl. The last question right now is about Perfling or binding the corners. What colors? What kind? what size? Is there a router bit to make the rabbet or it this all done with a plane, scraper and hope? How to attach it…. glue? pin nails? carpet tacks? White is what most people would use, but to me that might be too much of a contrast. Maybe MoP? A tan/khaki color? Finally, my health will continue to deteriorate. While it does bother me, it doesn’t scare me. When it’s done it’s done. However, it does piss me off! I have too much to do, to many mistakes in my life to make up for and have finally got time to get back to something I have always had a passion for, but never enough time. From here on out, I will do my best not to mention these problems unless they directly affect what I am doing. At times I will sound like I am typing drunk. Mostly I’m not. This is the result of the stupid meds. For instance, the original blog at the top took me two days to type and another day to vet, and I still found things wrong when I looked at it this morning. If it wasn’t for these few projects, I think I would go ahead and finish this mortal coil. I just can’t see having a stroke from this crap and laying in a bed as a veggie without even a side of dip! My wife couldn’t do the job nor could any of my friends or loved ones and I wouldn’t want them to have to go through life knowing they had done that, or, worse, have to deal with the legal system here. That’s it, no more serious stuff. Any more answers here will be to suggestions of answers to my questions. Stay tuned for the next installment, (#4), where I post actual pictures of the veneer and seek out help and advice of how to lay it out. My son was married on February 29th, Smart move, eh? At times I will sound like I am typing drunk. Mostly I m not. This is the result of the stupid meds. For instance, the original blog at the top took me two days to type and another day to vet, and I still found things wrong when I looked at it this morning. You are not alone Dallas. It will be a decade this month since I took myself off Topamax. I did not have any problems with communication prior to being OD on it. I still have to proof read very carefully. I still baffle spell checker. I still scramble 5% of the words I type. I still leave words out. I still use the wrong word. It goes on and on. the Drs claim they have never heard of side effects lasting more than 30 days. I learned the hard way to not trust them and read the hazmat data pages with meds very carefully. Recently a DR wanted to prescribe a stomach med. The haz mat data page said they thought it was safe to use for 4 to 6 weeks. It basically attacks the bones, especially the spinal column. I decided to play the hand God dealt me. Heh, Heh, Heh, TopamaxSurvivor, I was married the first time on October 31st. When she passed away after our divorce, I told every one that she turned the trick and I got the treat. I have done several guitars, four of them with veneer. I have done the vacuum bag thing twice and it works well as long as you prep correctly and are diligent in the first parts. First, use some veneer softener so it’s nice and flexible. When using one of the vacuum storage bags, make sure the nozzle inlet is on the back side of the guitar. For flat parts, I used a rubber brayer to get as many bubbles out as possible. Then, in the first five minutes of it being in the bag, I work all other bubbles out with my fingers through the bag. Use window screening as bleeder mesh. I also come back every 10 minutes or so just to make sure the vacuum is still pulled in the bag and to work on any small bubbles that might be around. Avoid any large overhangs in the veneer, as this will cause many more bubbles than if you have just a small overhang. The most difficult one I did to date was with highly figured eucalyptus and had to be done 4 times to get it right without sanding through. Ugh. Thanks Brian, I was thinking about this last night and this morning and was wondering if I could just use sand bags to press the veneer tight? Maybe 3 or 4 #50 bags would make sure nothing moves.